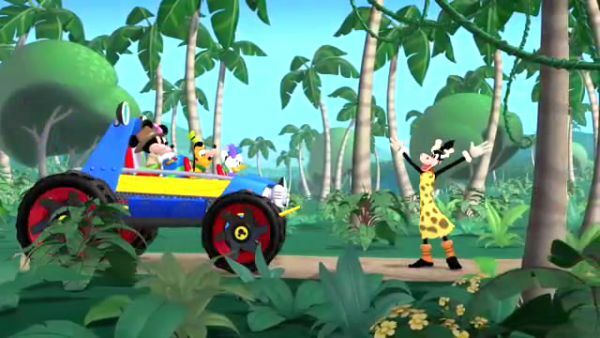 MICKEY MOUSE: Now, it's on to the hidden rainforest. Here we are. The hidden rainforest! CLARABELLE: Ooh. Moo-ta. Whoa! DONALD DUCK: What is that? GOOFY: Gawrsh! 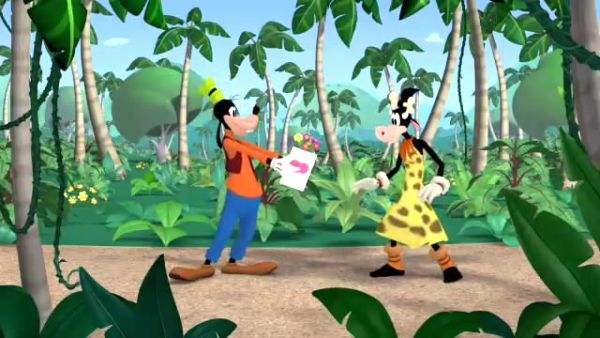 CLARABELLE: Moo-ta! 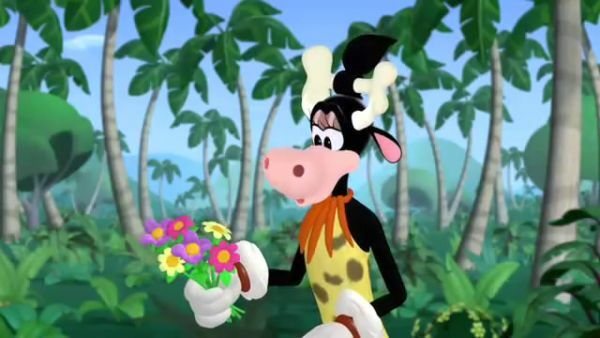 It's jungle gal Clarabelle, the cow that time forgot. Vam-moo. Vam-moo. DAISY: She wants us to vam-moo. Which I guess means, go away. MINNIE: Oh, if only we could speak her language. How can we tell her we'd like to be friends? MICKEY MOUSE: Maybe a mouseketool can help us. Everybody say: oh, toodles! ALL: Oh, toodles! TOODLES: Welcome to the jungle! 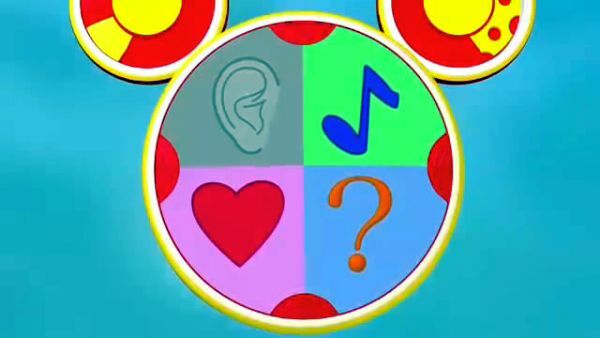 MICKEY MOUSE: We have pictures of a musical note and a heart. Which picture could be a clue? for a mouseketool that's all show the jungle gal we're friends? DAISY: Well, what does a heart mean? Yep, it can mean friendship and love. 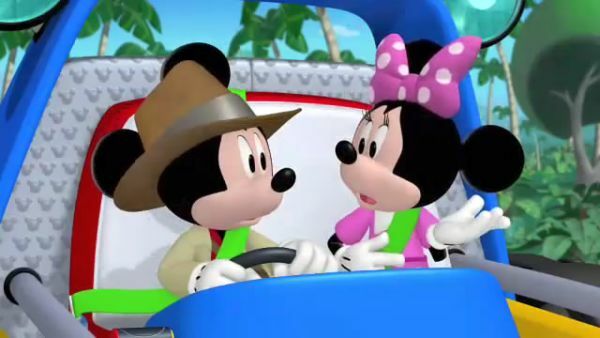 MICKEY MOUSE: Let's take a look at it. Toodles, what's behind the heart? MINNIE: Oh. It's a lovely card and a bouquet of flowers. Perfect! We've got ears, say cheers! GOOFY: Um! Here you go, ma'am... Uh, oh, I mean... 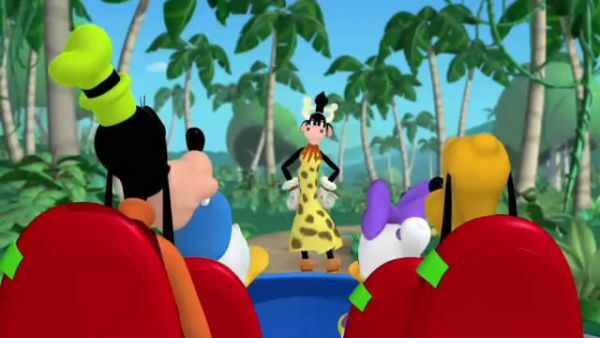 Jungle gal Clarabelle. CLARABELLE: Moo-lee. Moo-lee. GOOFY: That's right. Moo-lee. We're friends. Can you say friends? CLARABELLE: Fr... Frie... Frien... Moo! GOOFY: Well, that's good enough for me.